Killed in Action November 14th, 1944, in the Hürtgen Forest near the village of Vossenack, Germany. Buried in the Flatwoods Cemetery, at Woodsbend, Kentucky. He is the Father of, Thomas G. Ratliff, Harriett E. Ratliff, and Ova W. Ratliff II (Johnny). 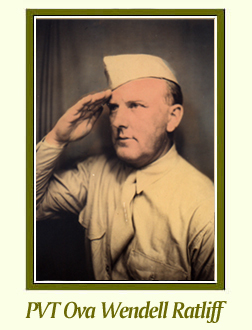 When Ova Wendell Ratliff was 34 he was drafted to serve in World War II. He was the husband of Hazel, age 29, the father of Thomas G., age 5, Harriett E., age 3, and Ova W. II (Johnny), age 6 weeks. On March 30th,1944, he was inducted into the Army at Ft. Thomas, Kentucky, and 6 days later was on a troop train heading south to Texas. He was on his way to Camp Fannin, a hot and dusty basic training camp for infantry replacement soldiers. The camp was located in the northeast corner of Texas, just 10 miles east of Tyler. My father spent his last summer on this earth training there with Company D, 65th Battalion, 14th Regiment, and completed his basic training on August 8th, 1944. After 10 glorious days at home, on a "delay in routing" furlough, Dad was back on a troop train heading for Ft. George Meade, Maryland. From there he was sent to a Port of Embarkation at Aberdeen, Maryland. In a letter dated Sunday, September 24, 1944, my father wrote these words; "My Dearest Hazel & Children, I am now aboard ship in the harbor. We came aboard not long ago. The officer said we might write so it could be mailed before we pull out. So, as my mind is very much on you all, My loved ones, I will write you a few lines. I can fully understand and appreciate the meaning of the words, 'These are the times that try men's souls.' As I stepped on the gang plank a little while ago I looked around and it seemed I could see each one of you and I breathed a prayer for you. May God Bless You." That troop ship sailed to southern England, where Dad was assigned to an Infantry Replacement Pool. After several days in England, he was moved to France, then to Belgium, and finally to Germany. 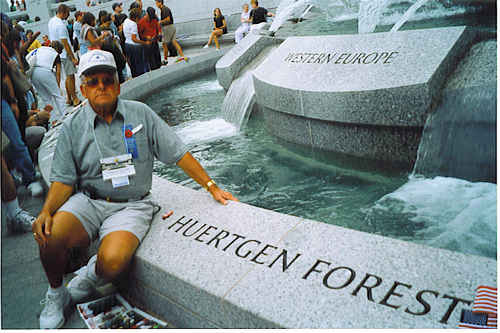 My father, having not yet been in battle, arrived in the Hurtgen Forest on the afternoon of November 7th, 1944, and was assigned to the 1st Army, 110th Infantry, 28th Division, Company C, as a replacement soldier. On that day Dad wrote two letters home, one in the afternoon and one in the evening. In one of those letters he told mother, "This kind of life is rough but it may be rougher. We can't move much more for the front lines are Close Now. I can hear the guns Now". That was the last we ever heard from him. On the morning of November 14, 1944, Private Ova W. Ratliff was listed as "missing in action," and one year later there was a finding of death. Much later, his remains were discovered on a tree covered hillside in the Hürtgen Forest, near the village of Vossenack. On May 28, 1949, Ova Wendell Ratliff was finally home. He was buried in his "native soil", in the Flatwoods Cemetery, at his beloved Woodsbend, Kentucky. It has been said, "that a man is not dead until he is forgotten." So, with that thought in mind, I decided to keep my father's memory alive by writing a book about his life. The book, "I Can Hear The Guns Now," tells his story using the 84 letters that he wrote home from his induction to his war time death. They are all in the book, unedited, just as they were written. If you would like to read a World War II story about love and sacrifice, please click here to visit the AWON website, where you can order the book.